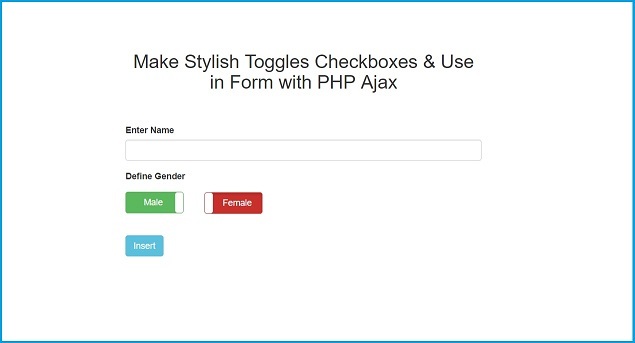 This tutorial is on How to Make Stylish toggles button from Check box HTML tag by using Bootstrap Toggle Jquery plugin and after creating checkbox toggle button how can we pass value of that button into Form by using Jquery and Insert into Mysql table by using Ajax with PHP. We all know web application must be with stylish user interface, so if UI of any web application has something different then it will attract more user and user can also easily understand how can we use this application. Bootstrap Toggle plugin will convert simple check box into highly flexible toggles button. So if user has come on site then he can understand how can use our web application. If you we have use Bootstrap for our web application UI then this plugin can be easily integrate into our application. Because this plugin is compatible with Bootstrap Library. Suppose you have developed simple form and in this you have used checkbox tag for any purpose, but simple checkbox UI is very common and we can see in any web based application but if you want to make form something different UI for checkbox then we can use this plugin because it will convert simple checkbox into stylish toggle button with two option and user can select option and by using this plugin we can use single checkbox for select one option from two available option. This plugin will easily to user. So, this post we have discuss how to initialize this plugin and we have also discuss some basic option like how can we define text on toggle button how can we change background color of toggle button. Then after we will seen how can we use value of toggle button as form field and lastly how can insert value of toggle button into Mysql table by using Ajax with PHP.